Thank you for a very interesting and well-designed program today with the Sterling Garden Club. I have since received very favorable responses from members who were present! Your organization was tremendous and you managed to move the program seamlessly from the slide presentation to the actual cooking- not an easy feat. 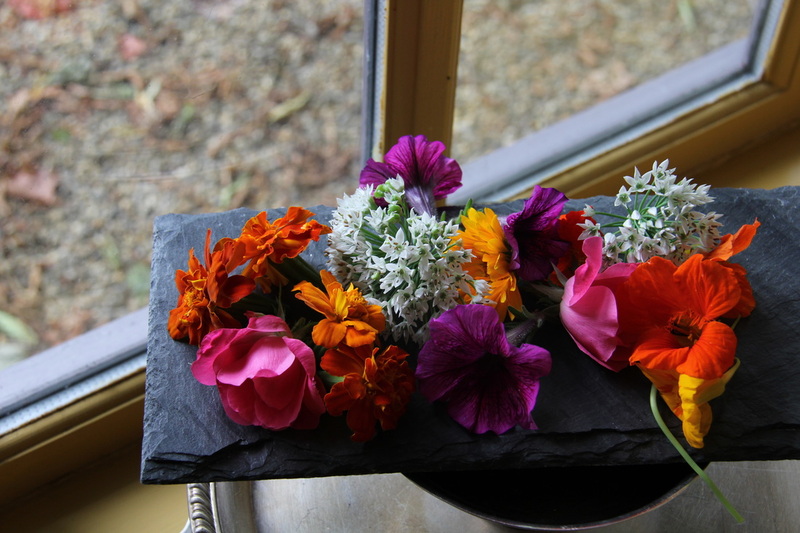 What I've heard most about though was the list edible flowers you referenced and how you use them. as gardeners, we're often more aware of growing than picking, and your reminder that we can do both was helpful. I'll look forward to receiving the books I and other members ordered and having a go at a couple of your scrumptious looking dishes. is inspirational........keep on doing your magic...you’re a sheer delight. Just a quick note to thank you for a wonderful program last night. By all accounts, it was a rousing success. We received many compliments on your cooking demonstration and everyone enjoyed the slide show of your "edible" gardens. Thank you for sharing your knowledge with us. "We had the BEST time with you the other night! What fun, and I can’t tell you how many little things I learned that will make a big difference in how I will plant my garden this year, and how I will prepare meals. I think your program was the highlight of the year, a sort of reward for the hard work the club does for the Town of Bedford. Everyone loved your slide presentation and discussion of your landscape design based on your love of healthy cooking and beautiful gardens. What a beautiful home and gardens you have! We all thank you so much for the delightful evening we had with you, and people are already asking if we can do it again next year. The wine may have helped, but you are a terrific motivational speaker, and we can’t wait to see you again." “Thank you so much for an amazing program last evening! Everyone thoroughly enjoyed it and went home inspired to get growing and cooking. Your program was the perfect synthesis of gardening and cooking, two areas of great interest to our membership and you are very knowledgeable on both topics. Thank you so very much for your excellent class at the Richards Memorial Library in North Attleboro tonight. It was wonderful! So informative! I’m the one with the small Instant Pot who has not used it yet! But I will tomorrow because now I know how! Tonight was a pleasure. I hope to attend more of your classes in the near future. Thank you so much for coming to do your Edible Flower program for us. So many people gave you rave reviews and they loved your food too! Your presentation and demonstration was phenomenal and we can't wait to have you here again. Thank you!!!! "​Liz Barbour, of The Creative Feast, presents one of the best library programs I've ever hosted. She's extremely self-sufficient, the audience loves her and she's very knowledgeable. ​Just show her to the space and let her go; she sets up and breaks down an incredible amount of material quite efficiently. ​Liz is very affordable for libraries and my patrons (at two different libraries) can't get enough of her. They want her back again and again. Her slide show and cooking demonstration about Edible Flowers is fantastic. It's a hit with gardeners, foodies and anyone who likes to eat! She handles all audience questions like the pro that she is, and I wish I could host her every month!! I've also seen her program for teens and the kids enjoyed every minute. If every program was as well-received as Liz's it would be a dream come true. Give her a call and you'll see I'm not exaggerating. :)"
I thoroughly enjoyed your class tonight! You have a fantastic and interesting way of presenting the information. Besides being a wonderful presenter with great humor, you write very well. I hope you are writing a cookbook. I would call it "Liz's Helpful, Got to have Kitchen Hints". I learned several techniques tonight that everyone needs to know about. Like, cooking cold oil and onions, how to properly chop a onion, using a serrated knife to cut chocolate and tomatoes, how to adjust your recipe to what you have on hand, toasting seeds, when to add spices, etc. You are a treasure! Best regards and hope to see your gardens!
" I attended your demo at the Dover Public Library, and just wanted to tell you again how much I enjoyed it! Have been practicing chopping onions using the method you taught - won't do it any other way now that I get it! Also, I made the Cranberry Raspberry Sauce w/ fresh rosemary, and it was WONDERFUL...Thanks again for your wonderful program - hope the Library Friends will invite you to speak again!"